The patient has been taking bevacizumab 5 mg/kg every 2 weeks in combination with 5-fluorouracil. A 64-year-old woman was diagnosed with colorectal cancer several months ago and was started on bevacizumab 5 mg/kg every 2 weeks in combination with 5-fluorouracil. She is brought to the emergency department by her granddaughter after she begins complaining of crushing substernal chest pain and shortness of breath. Measurement of vital signs reveals blood pressure of 181/100 mm Hg and heart rate of 87 bpm. Cardiac examination is normal, with regular rhythm, but electrocardiogram performed in the emergency department shows 2-mm anteroseptal ST elevation. An ST-elevation myocardial infarction (STEMI) is suspected and a STEMI alert is called. The woman is rushed to the catheterization laboratory where she is found to have an acute thrombus in the left anterior descending coronary artery. 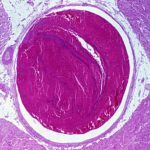 The interventional cardiologist notes that he thinks the thrombus was embolic in nature because he did not notice any ulcerated plaques and the remainder of her coronary arteries are without disease. The lesion is treated with balloon angioplasty and she is started on dual antiplatelet therapy.